The press release posted on the ACBF website is below. Details remain very sketchy on how this budget will be managed. There is reference to a communiqué by the Gates Foundation but we were unable to find it. 12 countries appear to have been selected for funding. What about the rest? How much information will be made public? The the three year and $32 million grant was announced in July 2014 on the ACBF site. ACBF nor the Gates Foundation answered our requests for more details. The African Capacity Building Foundation (ACBF), the World Health Organization (WHO) and Campaign for Tobacco Free kids (CTFK) are advancing coordination of the Tobacco Control Project across Africa funded by the Bill and Melinda Gates Foundation. The three Gates Foundation partners met from the 24th-25th of November and agreed that coordination and effective implementation of tobacco control will take a prominent place in the second phase of the project. During the two day sessions, the partners agreed on an effective mechanism for work at country level, developed a joint reporting tool and agreed to develop a monthly calendar of key activities as well as to hold regular calls to discuss their plans and progress at country and regional levels. The meeting served as a platform for the partners to gain a better appreciation of each organization's role in tobacco control; share work plans and deliverables as well as priority countries of focus and partners at country and regional levels. ACBF, as the host of the first coordination meeting, recommended that the partners build their relationship for tobacco control based on trust, transparency and communication. They were also encouraged to build on each other’s comparative advantage and competence. These outcomes will ensure coordination for effective implementation of tobacco control in Africa by avoiding duplication of activities and mismanagement of resources. Last week, the Gates Foundation officially released a communiqué announcing their commitment of more than US $32 million to support governments and Civil Society Organizations to implement tobacco control policies and programs in order to reduce tobacco use. 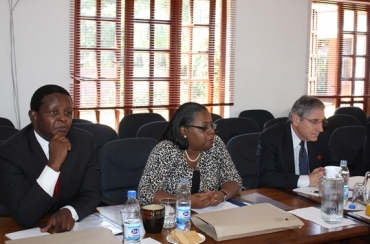 Under this funding, ACBF will support strategic grant-making and capacity building of the Centre for Tobacco Control in Africa, the University of Cape Town and Civil Society Organizations (CSOs) to advance evidence-based Tobacco Control policies in Africa including tobacco taxation, advertising bans, graphic warning labels, and smoke-free environments. The CSOs will be drawn from Uganda, Kenya, Mauritania, Botswana, Ethiopia, Senegal, Nigeria, and Ghana, Niger, Benin, Gabon and the Gambia. That's five "big' countries (Nigeria, Ethiopia, Kenya, Uganda, Ghana), two 'medium" Niger and Senegal, 5 small (Mauritania, Botswana, Benin, Gabon).